Identifies the supposed site of El Dorado on the apocryphal Lake Parima. This is John Thomson's stunning, highly detailed, and extremely interesting 1814 map of northeastern South America. Covers the modern day countries of Venezuela, British Guyana, French Guyana, Surinam and parts of Brazil. Thomson offers impressive detail throughout noting indigenous groups, missions, towns and cities, swamps, mountains, and river systems. Upper right hand quadrant features the title plate and two distance scales, one in British Miles and the other in Spanish Leagues. Cartographically speaking this is an often neglected part of the world - especially in the early 19th century. Though the coastlands had been well mapped early in the 16th century, the interior was rarely penetrated. The combination of mountainous terrain, daunting jungles, malaria, and unfriendly indigenous groups combine to make this area all but unexplorable - even today. Nonetheless, Thomson made a commendable attempt to piece together early conquistador accounts, explorer's journals, missionary records, and indigenous reports into a coherent mapping of the area. Probably the most interesting aspect of this map is Thomson's treatment of the apocryphal Lake Parima, located dead center. Lake Parima was first identified by Sir Walter Raleigh in the 16th century - though he admittedly never saw the lake himself. Raleigh associated the lake with indigenous legends of Manoa and the supposed site of El Dorado. 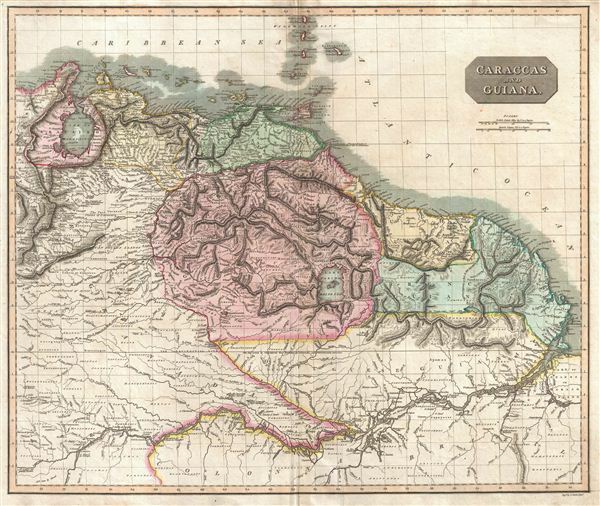 Many early maps actually show 'El Dorado' on the shores of Lake Parima, though Thomson curiously does not. However, his rendition of Lake Parima is vastly larger than most previous examples from the late 18th century - even those by other English cartographers such as Laurie and Whittle. The reality of Lake Parima and the Manoa is based upon Raleigh's misinterpretation of local trade networks. The Manoas were a river trading tribe based in the Amazon. Each year during the rainy season flooding on the Orinoco and Parima rivers would create a large flood plain and open channels of trade between the two otherwise unconnected regions. Raleigh misinterpreted indigenous descriptions these watery trade channels as a great lake. In general Thomson maps are known for their stunning color, awe inspiring size, and magnificent detail. Thomson's work, including this map, represents some of the finest cartographic art of the 19th century. Relief is shown by hachure with towns, cities, and major topographical features identified. Engraved in 1814 by J. Moffat of Edinburgh for issue as plate no. 53 in the 1817 edition of Thomson's New General Atlas. Rumsey 1007.075. Phillips (Atlases) 731. Newberry Library: Ayer 135 T4 1817.